Bring extra tubes … biking in the desert is a prickly business, but the rewards are worth it. Biking San Carlos can be bumpy and dusty, but the views are worth it. You can choose from road routes and trails. Bike to Nacapule Canyon. See various birds, including osprey and hawk. Jackrabbit and roadrunner also frequent this area. 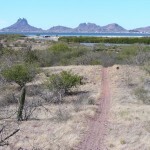 Biking in San Carlos Sonora Mexico to the old fishing village of Tomate. A rocky and loose gravel path zig-zags back and forth, and undulates over small hills at the base of Tetakawi. Click below to subscribe to the free weekly newsletter that's filled with information on San Carlos Sonora Mexico.